One small rise for HealthPostures, one giant leap in riser design. The Taskmate Executive riser is the first entrant into what we hope will become a much more populous category. A satisfyingly “clicky” switch and a highly responsive electric motor don’t disappoint – the Executive is downright enjoyable to adjust. 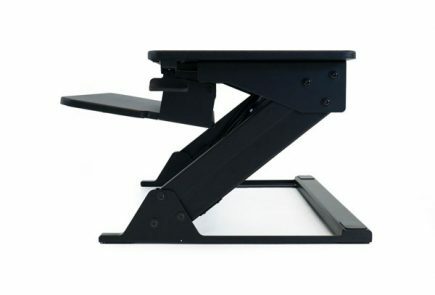 While it is an expensive option, and requires some tricky assembly, we’re extremely pleased with our first electric desktop riser. The first powered desktop riser we’ve seen. Taskmate’s Executive model takes all the knob-twiddling and lever-locking out of using a riser, and all the effort out of lifting a loaded platform. An adjustable keyboard tray gives this riser a valuable second variable-height component. Operating the Taskmate Executive is easy. Assembling it is not. Or rather, attaching add-ons is not. The electric body of the Executive comes preassembled. A rather limited set of step-by-step instructions show where and how pieces attach, but doesn’t cover some of the aggravating details (more on that later). All metal, quasi-military look isn’t going to win any beauty contests. Of course at this price you can buy the very nicest of electric adjustable-height desks. 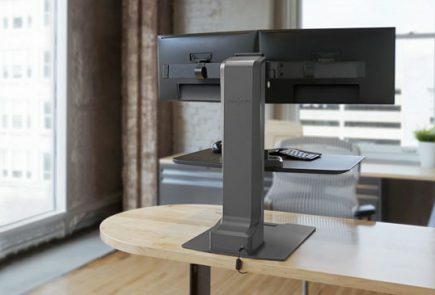 It may be a mark of geekiness (we’ll wear it with pride), but we got very excited when we learned that a test model of the Executive, a heavy-duty desktop riser from Health postures, makers of the feature-light Taskmate Go, was inbound. We’ve seen plenty of risers that rely on gas springs, nylon countertensioning systems, and a bit of a muscular assist to move from one position to the other. The Executive ditches all that in favor of a powerful, one-touch electric motor. We’d be lying if we told you that didn’t call to our inner gadget freaks. And the reality actually delivered. The Executive’s lift is quiet and surprisingly strong. Is it swift? Relatively; the Executive moves at a rate of just under one inch per second, so we’re setting no records here, but most users should be able to change position from sitting to standing in a little over 10 seconds. An impressive weight-capacity of 50 lbs means that the Executive can hoist the better part of your office with it. Sound is always a major concern when shopping for a motorized office product, but the Executive is fairly stealthy. Motor noise of around 65 decibels is noticeable, but hardly deafening (for comparison, a conversation at one meter generally produces a similar level of noise). So that’s the lift, but a lift isn’t much without anything to, well, lift. Taskmate bundles several handy add-ons in with the main body of the Executive. We’ve said it before, and there’s no doubt we’ll say it again: having two points of adjustment on a desktop riser is vital. 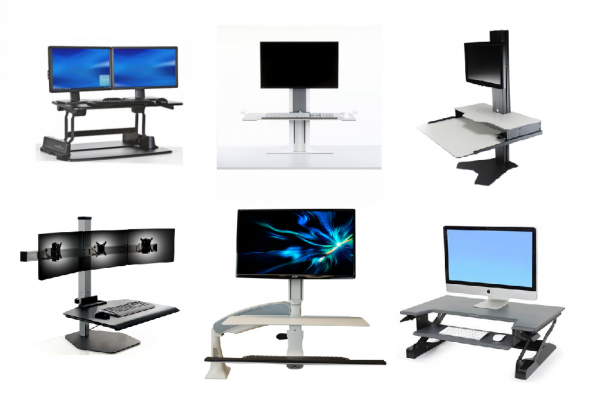 While some options (we’re looking at you, VariDesk) encourage users to put a monitor stand on top of a single moving platform, we’d steer most users away from this option. Instead, it’s better to have a riser that has at least one other variable-height platform. It’s an important addition – the ideal distance between monitor and keyboard changes as a user moves from sitting to standing, and single-platform models simply can’t address that shift. 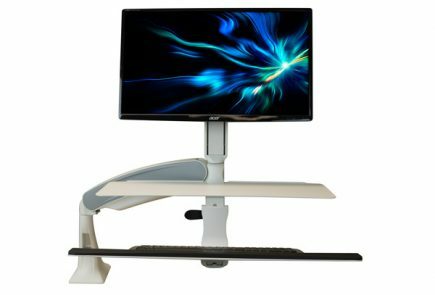 While most risers we’ve seen recently provide an extra monitor platform, HealthPostures instead elected to bundle an adjustable keyboard tray in with the Executive. The Executive keyboard tray can adjust vertically, and also allows users to change tilt, a feature we haven’t seen on any risers before, but a very ergonomically helpful one. However, be prepared for some annoyance with the arm, as it uses a knob to tighten and stay in position. More expensive systems use lift-and-lock, or lever-lock mechanisms for a reason – once a keyboard tray is locked in position, it isn’t moving until you want it to. On the other hand, a knob doesn’t truly lock the tray, and pressing down too hard on your keyboard (read: not very hard) will slowly but surely sink the Executive tray. Not only that, but it pushes users a good distance away from the main platform. Precision work on a distant monitor is understandably difficult, so you may want to pick up an articulated monitor arm as well. The two tablet/document holders that come bundled with the Executive are also nice additions. Once attached, they give you an angled platform on either side of your main worksurface. Apart from providing some extra workspace, they also give the Executive a modern – nay, a futuristic – appearance, and help bust up an otherwise industrial aesthetic. A trapezoidal desktop platform is included as well, and attaches to the top of the Executive to expand your main working surface. Once you’ve got all those add-ons, you’ll likely want to attach them. And that, sad to say, can be a little frustrating. Not to point any fingers, but this is mostly HealthPostures’ fault. The owner’s manual that comes with the Executive is sparse, to say the least. Although it includes helpful pictures, it simply skips the details of how to put the Executive together. It’s likely that seasoned DIYers – really anyone on the handy end of the spectrum – won’t even need instructions to put the Executive together. If you’re on the other end of the spectrum, then fear not. We are too, and we encountered every problem possible during assembly for the sake of easing your experience. You’ll notice that the Executive comes with screws and two types of nuts. Ignore the round-ended nuts for now; you’ll be using the ones with the inner nylon ring. The nylon locks the nut in place and prevents slippage during use. However, it also makes the nut impossible to fully tighten by hand. Instead, use a ratchet with a 3/8” head. Screws with small, square sections beneath the head should be fully inserted into square holes, which will brace them during tightening. The flat-headed screws used to attach the keyboard tray and desktop platform must be braced with a screwdriver on one end while tightening. You may be initially confused as to how you’re supposed to attach the desktop in the first place. Out of the box, the attachment points are covered by a rubber mat. Fully raise the Executive, and then look underneath that platform – you’ll find several holes in the metal body that can accommodate the bolts. Poke through these holes with a pencil or screwdriver and you’ll raise “kiss cuts” made in the rubber mat. You may need to use a utility knife to fully expose the holes, but once you do, run the screws through, then tighten the nuts as before. And there you have it, an assembled Executive. The Taskmate Executive comes protected by a 5-year warranty from HealthPostures.